This is a very nifty gadget for anybody doing fair isle, stranded or Norwegian style colour knitting. The thimble separates the two strands of yarn, making Norwegian style knitting a breeze. Ideal for continental style knitting, where you hold the yarn on the left hand. Also useful as an aid to keep tension when crocheting. The inside diameter of the thimble is approximately 0.8-0.9cm. It will fit tightly around a finger circumference of around 5.6cm. 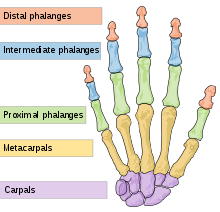 As you can see in the video below, you usually wear the thimble around the intermediate phalanx of one of your fingers (see image) or over your finger nail - whichever fits best.